Frankly, I don't care one way or the other if PEPCO is acquired by Exelon. I don't think it will have negative consequences on my ability to use electricity. I don't see Exelon as being much of a hindrance, depending on the effectiveness of the DC Public Service Commission, to increasing renewable sources and the creation of district energy systems here and there across the city (such as at the Walter Reed site, which already has a power plant, or the proposal for the Southwest Eco District, although to do so there, Congress will have to change some laws). In terms of reliability of the grid, if anything, Exelon's presence, being a better managed company, will likely have positive impacts. Plus, Exelon is not opposed to the integration of bicycle access in transmission corridors, which is much different from PEPCO, which for the most part is obstreperous. So that's a benefit too. But some residents think this is a good opportunity to consider the acquisition of the transmission infrastructure for the creation of a municipally-owned utility. I agree, but rather than having such meetings towards the tail end of the process, this possibility should have been raised in the beginning, or even before, such as what was proposed for some time by Councilman Roger Berliner in Montgomery County, Maryland (see "You can't wish away the need to upgrade aging utility infrastructure" and "Press piling on Montgomery County's utility dreams"). 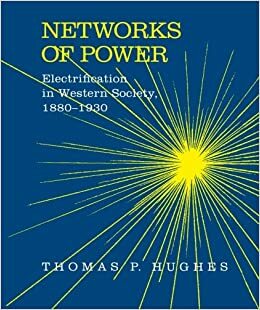 I still need to read Thomas Hughes' Networks of Power, a comparative history of the development of electricity generation and transmission systems in the US, UK, and Germany. The one thing that concerns me about local control of utility infrastructure is the opportunity for political patronage and corruption or misuse of funds. For example, Philadelphia Gas Works, owned by the City of Philadelphia, is a mess. The mayor tried to get it privatized, to get money and the capital to fix the system, but the City Council didn't even schedule a hearing, and the offer expired. Seattle Public Utilities (garbage, water and sewer, not electricity) is supposed to be pretty good, but some people complain that the agency pays for certain kinds of infrastructure projects that should be paid for from other funds, leading to higher rates. And certain business interests pressed for a referendum separating control of Portland's water system from the local government using similar arguments. While LA's Department of Water and Power has big misuse of funds issues now, during the Enron electricity manipulations in the California market, they were heroes, because LA residents were immune because their power needs weren't subject to the same kinds of market tampering. Portland tried to buy the local utility, when it was pushed into bankruptcy as part of the Enron debacle, but business interests prevented that from happening, somewhat similar to the machinations by business interests to get the City of Cleveland to sell its local utility interests to the local utility company--something that pushed Dennis Kucinich out of office, but the City still owns its streetlights--something that Detroit, having gone into bankruptcy, no longer does. Closer to DC, the City of Manassas runs a number of well respected utility services, including electricity, and another great example of excellence in publicly owned utilities is EPB (Electric Power Board) in Chattanooga, which has implemented fiber to the home via the electricity infrastructure, with Internet speeds as fast as 1GB. It's too late, but it would have been interesting for DC and Montgomery County to have gone in together on a bid. Recent news that utility regulators in Delaware and Maryland have approved the proposed $6.8 billion Exelon-Pepco merger, puts major pressure on the final body left to vote -- the three-member DC Public Service Commission. It is expected to decide by late August. However regardless of what the Commission decides, DC residents and ratepayers will be better off with an independent consumer-owned utility in DC, than with an Exelon-Pepco merger. I wonder if anyone went? All the solar co ops around town oppose the merger. I think most of the council does too. "D.C.'s Office of the People's Counsel has been tasked with studying whether the city could replace Pepco with a city-owned electric utility. The city council approved $250,000 in the budget for the Office of the People's Counsel to look at the benefits and feasibility of a city-owned power company. "Council member Mary Cheh (D-Ward 3) pushed for the measure, and says other big cities such as Seattle and Los Angeles have already turned to municipally owned electric utilities. ""We could get lower rates, we could have, you know, and environmentally progressive set of policies, and we could have greater responsiveness in something that we own and operate," Cheh says. "And there would be no interest, as such, in profits. Any monies that were earned could be plowed back into the utility." "Cheh adds that she has little sense of whether the move is indeed right for the District. ""I don't know exactly how we would go from here to there. What would be the financing? How feasible would it be? You know, exactly what would this entail?" she says.